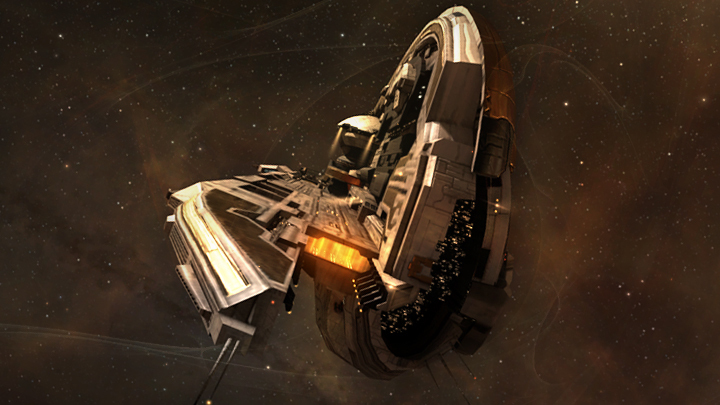 Within the space of 24 hours the #REKKINGCREW from Derelik have achieved their second successful kill in the Domain region, going from a Hel Super Carrier to this most recent Aeon. Thus making it the 7th Super Capital kill of May alone, easily beating the number of kills in the equivalent time frame in April. This one died in the extremely deadly capital system of Mai, which is well known for it’s kick out station and camping crews. Making it the graveyard for 125 Carriers, 36 Dreadnoughts, 4 Super Carriers and 3 Titans at the time of writing according to this zkillboard stats page. The unfortunate pilot to get trapped in the jaws of the #REKKINGCREW this time is Golbezz, member of Disbanding As We Speak [DAWS] who, prior to the Aeon’s death were part of the Dead Terrorists [IKILU] Alliance. As far as I know the Aeon was caught and killed in the standard way whilst on its way to being sold. The pilot felt a little bad about the whole thing insofar as his corporation had only been in the alliance for a few hours and he had been advised against travelling through Mai. Not ones for taking ourselves too seriously and unable, as we were, to do anything to save the Aeon, it was, therefore, decided that we should lighten the mood somewhat by temporarily booting the Aeon’s pilot corporation from alliance in order to see how many of our guys could get there in time to be on the mail. There has been multiple cries of the alliance wanting to keep their “Killboard Green” with the removal of the corp but according to Letelio this was not entirely the case and meant to be a light hearted thing. So this starts with poor recruitment standards in [DAWS.] We initially put a spy in because they used caps and we thought it’d be funny and their recruitment standards were so bad they even let a char into their alliance that for 2 years had been flying a Nyx for PL/#REKKINGCREW. We heard that some dude was giving his chars and assets away and giving everything to a friend which is interesting… because he never left the corp. The new owner was rage selling a lot of the previous owner’s assets and we ran intel on both the new and the old owner and looked for changes, one of which was the bio’s. Golbezz bio had the description ‘under new management’ long with a couple of the others. We were watching the aeon, and our ‘grapevine’ informed us he was selling the ship and linked us the forum thread. He posted in the thread that he’s been offered 25b, and 26b if he was willing to move it. So we tracked him to find out where he would go, he caught us off guard and we had to move quickly. He jumped to roushzar, so we figured he was heading straight south, we’ve used the system before as a mid to get in range of the Amamake area. There’s only one reason you go south to Roushzar from the Amamake area …if you’re going to Mai next. We scrambled a HIC over there, and the dude shortly showed up later with 2 alts, one in a keres, one in a svipul. Shortly after, 2 noobships undocked, we figured he’d try lighting 2 cyno’s at once – one as a decoy, and he’d probably try self destructing them too. Sure enough he lit, the cyno’s both self destructing only seconds later. The guy flying our HIC is new to playing that particular role, got a bit flustered and missed the warp. The aeon jumped in and warped towards a safe spot. We managed to probe him, but our probe hit was bad and we failed to get his exact spot. We jumped the fleet in and a couple of us went to work trying to decloak. Unfortunately we had no luck though whilst all the time he could be preparing an exit cyno. Then it hits us. He’s travelling in a straight line, from the cyno, through our probe hit, and continuing in a straight line the other side. All we need to do is work out which direction he came from but the cyno’s are dead so we d-scan down the wrecks from his dead cyno noobships. Align towards it, and jet a can whilst also jetting a can at the probe hit. Suddenly, we know what direction he’s in. The fleet goes to the probe hit, and burns in the opposite direction to where the cyno velator is (or was, it’s now a wreck). 70km later, we successfully decloak him, approximately 3-4 minutes after he jumped in so he’d still have had a jump timer. It appears that the information came from an internal source inside of [DAWS.] before following the path of the usual hunt and kill. Obviously the #REKKINGCREW team are experienced in what they do and are able to predict the most likely route that will be taken for the majority of destinations, even if the start point is unknown. 1-Confirmed I was travelling to sell this toy; this was my third jump, and MAI was the most dangerous part of this trip. Avoiding it would have been +20 cynos added to the trip, and I’m lazy. 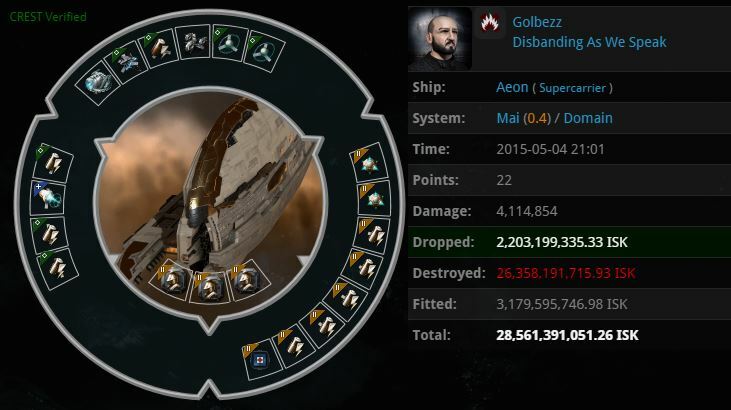 For my first super loss I’m happy I was dropped by such a fleet. 2-DT has nothing to do with this. The corp kick was a joke as I was sharing the live feed on coms. 3-My POV debrief: TL;DR well done hunt. —-I had cynos in system for a couple hours and thought the potential enemy cynos had left after a while. —-I had 3 cynos ready for a decoy effect in system, just in case with the 3 neutrals in system & 2 being not docked. I thought they were afk after killboard / TZ checking and a few other people watch-listed. —-Due to IRL timing issues I wanted to finish this jump tonight. I jumped in, which was followed immediately by hictors entering scan. —-The Aeon warped away. My friends had multiple sets of probs on scan and found my approximate location on the first landing on which I cloaked. —-My friends for tonight cyno-ed a fleet on the top of their probed coordinates. One of their ships achieved to decloak me on its random axis while I was trying to get exit cynos sorted. Also: may the 4th be with you, thank you for your cooperation. The pilot appears to be fairly capable of moving his ship solo with the use of multiple cynos, the main problem was the lazy factor in refusing to avoid Mai. Even with the ship being hunted, if a different route had been taken it may have had a better chance of survival. Clearly the removal of the corporation was not specifically due to killboard efficiency but did relate to the possible kill for max whoring purposes. Hopefully the corporation will be back shortly in the ranks of [IKILU] until possibly the same thing happens again. EN24 note: As you avid readers are aware there has been a dramatic increase in reports of Super Capital losses at present. Following this we will now be posting a weekly summary (where possible) relating to the ones for that week unless any unusual circumstances were involved. Most likely excluding Titan and Revenant losses. I must show my thanks to this writer just for bailing me out of this particular matter. After looking throughout the the net and meeting basics that were not helpful, I assumed my life was well over. Being alive minus the answers to the problems you’ve fixed all through your review is a crucial case, as well as the kind which might have negatively damaged my career if I had not noticed your website. The knowledge and kindness in controlling all things was important. I am not sure what I would’ve done if I hadn’t come upon such a stuff like this. It’s possible to at this point relish my future. Thanks for your time so much for the high quality and result oriented guide. I won’t hesitate to endorse your blog to any person who will need support on this matter. I have been examinating out many of your posts and i must say nice stuff. I will definitely bookmark your site. I loved as much as you will receive carried out right here. The sketch is tasteful, your authored subject matter stylish. nonetheless, you command get bought an edginess over that you wish be delivering the following. unwell unquestionably come more formerly again as exactly the same nearly a lot often inside case you shield this increase. Wow, great blog article.Much thanks again. Really Great. I just want to tell you that I’m new to weblog and absolutely loved you’re web blog. More than likely I’m planning to bookmark your website . You actually come with fabulous articles. Kudos for sharing with us your website page. hey there and thank you for your info – I’ve certainly picked up anything new from right here. I did however expertise several technical issues using this site, since I experienced to reload the site lots of times previous to I could get it to load correctly. I had been wondering if your web hosting is OK? Not that I am complaining, but sluggish loading instances times will sometimes affect your placement in google and can damage your high-quality score if advertising and marketing with Adwords. Well I’m adding this RSS to my e-mail and can look out for a lot more of your respective exciting content. Make sure you update this again very soon..
I¡¦ve been exploring for a little bit for any high-quality articles or blog posts on this sort of area . Exploring in Yahoo I ultimately stumbled upon this site. Reading this information So i¡¦m happy to express that I have an incredibly just right uncanny feeling I found out just what I needed. I such a lot no doubt will make sure to don¡¦t disregard this web site and provides it a glance regularly. This is very interesting, You are a very skilled blogger. I’ve joined your rss feed and look forward to seeking more of your magnificent post. Also, I’ve shared your website in my social networks! Where online can a certified psyciatrist message write-ups (or blogs) for them to come to be preferred? Just how do you discover various blogs on Blog writer with key phrase or search? I have been surfing online more than 3 hours lately, but I by no means discovered any fascinating article like yours. It¡¦s pretty price enough for me. Personally, if all web owners and bloggers made good content material as you did, the net will likely be a lot more helpful than ever before. Leave a Reply to Recreation Center Click here to cancel reply.